Agriculture is vulnerable to the interannual climate variability and to its unpredictability, in such a way that most agricultural decisions taken within the time horizon of several months are made in a conservative manner, supposing a near-pessimist scenario. The improvement of climate prediction may help the strategic view, mitigating unwanted impacts and taking advantage of favorable conditions. This chapter presents the development of an Artificial Neural Network (ANN) model for seasonal precipitation forecast based on climate indices, focusing on the practical aspects of selecting the best predictors, defining ANN architecture, data handling and ANN training and validation. The study case is the Pardo/Mogi-Guaçu rivers watershed in Brazil, which is characterized by intense sugarcane plantation for both ethanol and sugar industries. The results demonstrate how the methodology for seasonal precipitation forecast based on ANN can be particularly helpful, with the use of available time series of climate indices. Several human activities are strongly dependent on the climate conditions and its variability, especially those related to water use. The seasonal precipitation controls the need for irrigation in agriculture, river navigation conditions, operation of multiple purposes river reservoirs, and the overall water resources for many other uses. The prediction of precipitation for weeks or months ahead may improve decision making, optimization of water resources management and have benefits for economy (Chiew et al., 2003). Particularly, agriculture is vulnerable to the interannual climate variability and to its unpredictability (Hansen, 2002; Ogallo et al., 2000). The time of seeding, soil preparation, irrigation schedule and management, variety selection, productivity estimates and harvesting are some examples of agricultural practices which depend on the climate variability. Owing to climatic uncertainty, most agricultural decisions taken with time horizon of several months are made in a conservative manner, which prescribes a near-pessimist scenario (Hansen, 2002; Jones et al., 2000). The improvement of climate prediction may help the strategic view, the mitigation of unwanted impacts and to take advantage of the most favorable conditions. Seasonal precipitation forecast in the early wet season has special importance to agriculture. Most crops depend on the first rains for seeding and emergence, rain amount and persistence for the development of the plants, and the occurrence of short dry spells for the harvesting. The prediction of a low rainfall in the early wet season may delay the timing of soil preparation and seeding, or even to provide irrigation and supply the crop water needs. On the other hand, if a pronounced wet season is expected, the decision may be to expand the crop area and/or reduce irrigation. Global and regional atmospheric models have been widely applied for seasonal precipitation forecast. However, despite their increasing forecast performance, they still lack ability to produce reliable precipitation forecast for local specific areas (Koutsoyiannis et al., 2008). Additionally, running atmospheric models require large computational effort and model-specific knowledge. In turn, data driven models such as Artificial Neural Networks (ANN) are an alternative approach for local seasonal precipitation forecasting (Zwiers and von Storch, 2004; Nasrallah et al., 2001). ANN may be concerned as a relatively recent solution to the problem of predicting the output of complex systems, used on a wide range of fields, such as environmental science, pattern recognition, remote sensing and financial management (ASCE, 2000; Dawson and Wilby, 2001). ANN models have also been used for a number of hydrologic problems, including rainfall-runoff modeling (Minns and Hall, 1996; Tokar and Johnson, 1999), streamflow forecasting (Dawson and Wilby 2001; Maier and Dandy 2000; Jeong and Kim, 2005) and short- and long-term precipitation forecasting (French et al., 1992; Luk et al., 2001; Silverman and Dracup, 2000). Methods such as ANN applied for seasonal precipitation forecasting may be easily integrated to an expert agricultural decision support system, which helps improving irrigation management and strategic decisions (McIntosh et al. 2007; Hansen, 2002; Ogallo et al., 2000). 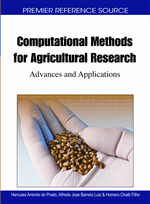 This chapter presents the main concepts concerning precipitation forecasting and how it may be used for agricultural purposes. The main focus of the chapter is how to develop an ANN model for seasonal precipitation forecast. The steps of defining the problem and the variable to be forecasted, choice of predictors, definition of ANN architecture, data handling, ANN training and skill assessment are discussed. To illustrate the methodologies presented, the case study is the Pardo/Mogi-Guaçu rivers watershed in Brazil, which is part of the contributing area of the Grande River, a region characterized by intense hydropower generation and sugarcane plantation for both ethanol and sugar industries, besides other seasonal crops are cultivated in a lesser extent.